Looking for fresh, home-made and (mostly) locally sourced food? Then Granite’s Coffee Shop is for you. Choose from our comfortable indoor seating or a view of the railway and woods from the patio. Adjacent to our Garden Railway and Crazy Golf, you will find Granite’s Shack, where you can buy drinks, ice creams and pancakes. Parking is free, and we don’t charge an entrance fee, so we depend entirely on the income we receive through Granite’s Coffee Shop and Shack to pay the running and maintenance costs of the site. 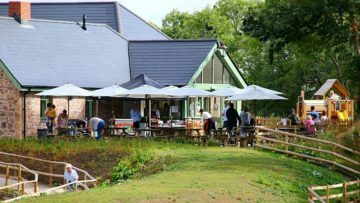 We hope that you’ll take time on your visit to enjoy a coffee, an ice cream, or a bite to eat and help us to keep the site open for you to enjoy. Granite’s Coffee Shop is open every day from 10am to 5pm, last orders are at 4.30pm. Granite’s Shack is open every fine weather day during summer school holidays and at weekends in the spring and autumn.